Here's another owl I made last week. 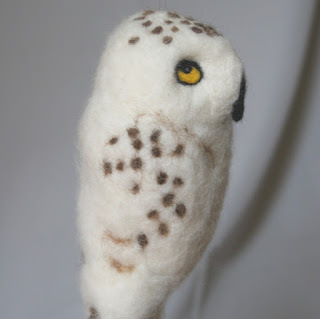 Last summer I was surprised at how people reacted to the owls I made. I think it may be because of the bigger eyes they have, which seem to draw the attention. They're also bigger, on the whole, than the birds, though the birds are more colorful. Whatever it is, the best part of displaying my work is to see the smile or the light in the eyes when someone enjoys something I made.